The Word Players read random selections from books and bits and pieces about chance, prophecy and revelation, a reading from the I Ching, and silence, confront a 1200-foot tape of numbers (1-62) which is stopped and started by direction, but no one knows which number will come up next. The number on the tape determines who reads and what the material will be. The players decide how to do the readings. The recording session has not been cut, and sped-up tape sounds are included as the pieces are selected. Readers include David Haight, Sandra Ley, Sherry Pockell, Ann Rivers, Judith Seto, Edgar Walker and Charles Wallrich. Peter Nicholson performs the reading from the I Ching. Technical Director, Edgar Walker; Director, Judy Ratner; Production assistant, John Agress; button pusher, John Shardlavski. 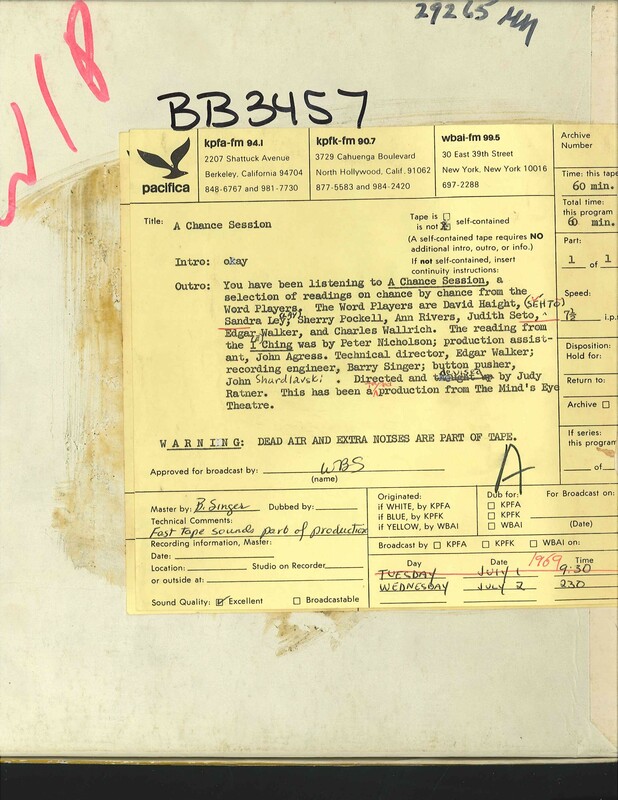 This recording was formerly cataloged as BB3457.